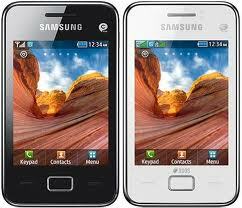 Samsung today announced the launch of its first ever Dual SIM smartphones in the Indian market the Galaxy Ace Duos (SCH-i589), Galaxy Y Pro Duos (GT B5512) and Galaxy Y Duos (GT-S6102). The Samsung Galaxy Ace Duos (SCH-i589) comes with Dual SIM Dual Active technology that allows consumers to be available on CDMA and GSM numbers all the time. 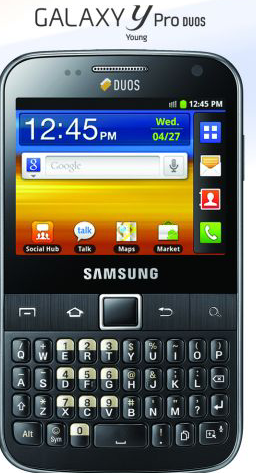 The Galaxy Y Pro Duos (GT B5512) is the 1st Android based Dual SIM QWERTY bar device. With WiFi direct and BT 3.0 support, the device offers improved connectivity along with an enhanced productivity with Touch + QWERTY Key Pad and an optical track pad. With a 6.5 cm LQVGA, Capacitive Touch Screen, 3MP FF with VGA Video Telephony Camera and a 1,350 mAh battery, the Samsung Galaxy Y Pro is priced at Rs.11090. Samsung Galaxy Y Duos (GT-S6102) priced at Rs.10490 is Samsung’s 1st full touch Dual SIM device. The Galaxy Y Duos offers the users the opportunity to use the device for both data & call simultaneously, enabling them to maintain a work life balance. The device comes uploaded with Social Hub and Samsung messenger, Chat ON. With optimized UX for QVGA Resolution 7.85 cms (3.14”) Screen and 832 MHz Processor, the device offers spacious viewing and speedy performance. Samsung Champ Deluxe Duos (C3312) is a powerful and yet a compact device. Its slew of features such as Virtual QWERTY, Hindi language input, native Facebook and Twitter apps, all messengers including Yahoo, MSN, GTalk, etc, make it an extremely appealing device. In addition, it comes with 3.0 Bluetooth connectivity at 24MBPs, Push Mail with Activesync and Opera Mini Browser. ChatOn (Samsung Messenger service) available on the phone provides a new way to keep in touch. The 1.3MP camera, MP3 player, FM radio and 3.5mm ear jack make sure that the user gets an entertaining multi-media experience. The device is priced at Rs. 4790. With a 3.0” QVGA TFT with C-TSP, 3MP camera and 1000mAh Battery, the device is priced at Rs. 6290.